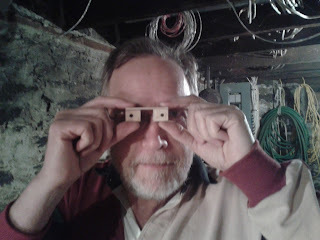 My Dad, pictured above, has been awesome about letting me come over and helping me work on the Naomi robot. The motor came with threaded holes for putting screws into, but none of the hardware stores I visited had screws that were small enough. But the gentleman at The PC Room, a computer repair shop on Gladstone in Ottawa, let me look through his jar of odd screws, and we found some that were the perfect size. He let me have them for free. 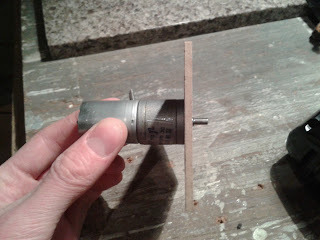 Dad and I drilled two holes in the masonite and screwed it to the motor. Then we mounted the rotating arm on the motor's shaft. We needed to anchor the ends of the metal dowels somehow. We decided to cut some little blocks of wood and drill holes that were just barely big enough to fit the dowels into. We had to place the holes carefully, because the dowel had to be held high enough off the masonite that the moving part would be free to move without rubbing against the masonite. We hammered the first dowel into one of the blocks, slipped on the spring and the moving part, and then hammered a block onto the other end. Then we glued the two blocks to the masonite with Gorilla Glue and clamped them in place for a couple of days to dry. 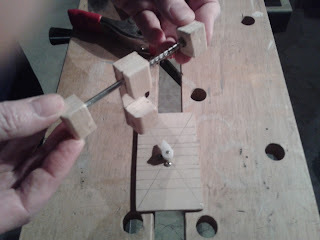 The dowel isn't technically "attached" to anything, but the blocks fit on so tightly and are glued so close together that there's no way it could ever wiggle out. 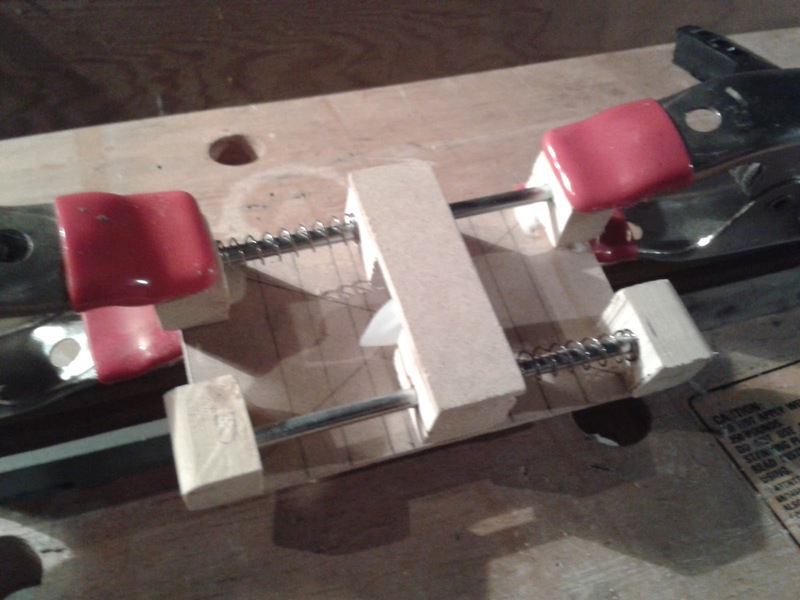 Once the glue was dry, we stuck the second dowel through the moving part, put a spring and two blocks onto it, and glued those blocks to the masonite as well. Notice how the two springs hold the moving part nicely in equilibrium when the motor is at rest. At some point in the design process, I'd started referring to this part of the robot as the "Heart of Gold," after the improbability-powered spaceship in The Hitchhiker's Guide to the Galaxy. The motor is powered by eight AA batteries for a total of twelve volts. 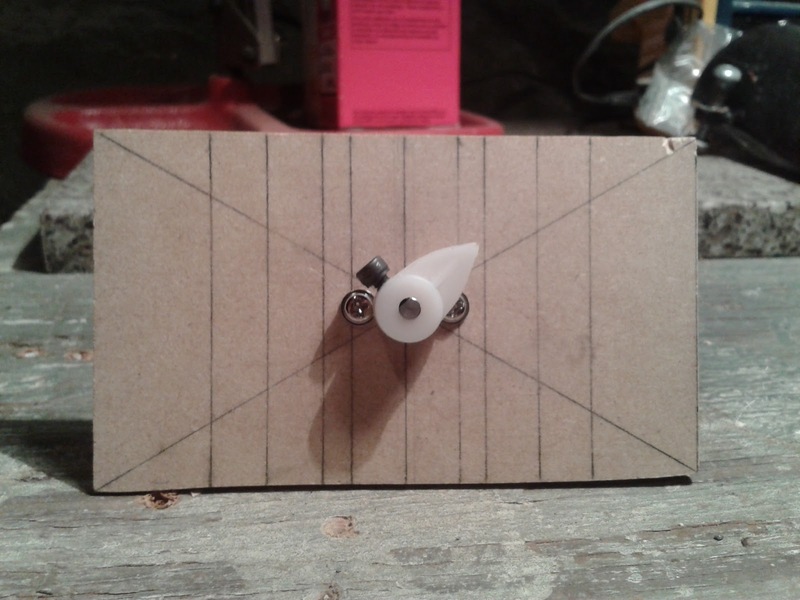 Depending on which wires you attach to which leads, the motor can be made to turn in either direction. 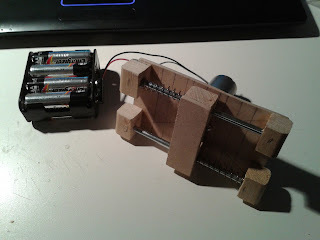 I discovered that it needed to turn counter-clockwise, because otherwise the moving part bonks into the black screw that holds the rotating arm in place. And does it work? Behold! There are no frames missing from this animation -- that's actually how fast the moving part bounces back. I cannot believe that this actually works. At least, it works so far. Next we'll have to see if I can transfer motion from the Heart of Gold to the other part of the mechanism. Just finished a promotional video for the puppetry workshop I offer to schools and day camps in Ottawa, Ontario. Full information can be found here at my website. Special thanks to Phil Hoyeck and the staff and students of Bayview Public School. In one of the special features on the Corpse Bride DVD, the stop-motion animators describe the process of animating a character whose dress extends all the way to the floor. The character is built without legs; instead, she is supported by a rig underneath the dress that can be adjusted minutely up and down. This allows the character to be given a vertical bouncing motion that simulates walking. When I saw this, I immediately wondered if a similar thing could be done with a puppet in real time. One of my characters, Naomi, also has no legs, and also has a dress that extends all the way to the floor. If she were placed atop an animatronic rig that was itself mounted on a small remote-controlled car, Naomi could seem to walk across the floor all by herself. Unlike the Corpse Bride characters, she would need to move side-to-side as well as up and down, in order to better mimic the way she walks when I'm actually puppeteering her. I've never made an animatronic before, so there's a lot of experimentation involved, and it's entirely possible that even once it's built, it won't work at all. The part I'm working on right now is what you might call the "powerhouse" of the animatronic -- the motor and the attendant mechanisms that turn rotational motion (circular) into translational motion (side to side). The problem I ran into right away is that every mechanism I could find that did this, slowed down as it changed direction from right to left and from left to right. But a puppet needs to bounce with each step -- she needs to speed up as she changes direction. The solution came from this TED Talk, in which Robert Full explains that the basic movement of any animal limb is, essentially, that of a pogo stick. Clearly, the answer was springs. Using this mechanism as a rough guide, I created a design that had springs at each end. A single pinball-flipper-like rotating arm would push the moving part all the way to one side. Once the arm rotates far enough that it is no longer touching the moving part, the spring will cause the moving part to bounce back toward the middle. ...And taking out the springs inside them. I bought a motor from Hong Kong on eBay with a speed of 60 RPM; I'd previously calculated that a hand puppet takes approximately two steps per second when walking, and one full rotation of the motor will equal two steps for Naomi. With help from my father (and his power tools), I cut out a piece of masonite that will serve as the non-moving part of the rig. For some reason, Blogspot insisted on rotating the above image 90 degrees when I uploaded it, and I can't figure out how to change that, so imagine that it's on its side. 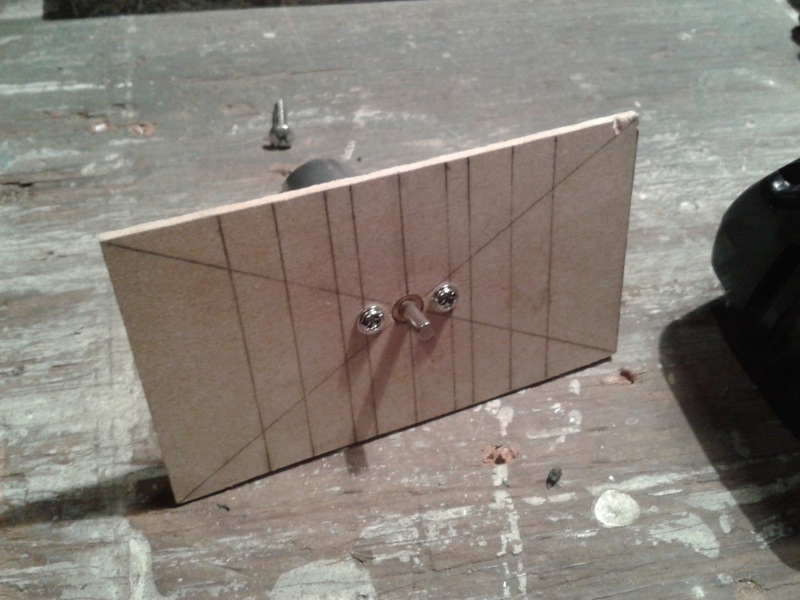 The hole in the centre is for the shaft of the motor to poke through, and the vertical lines I've drawn on it (which here appear horizontal) indicate how far the moving part (which supports the puppet) will move from left to right. I'll explain how I calculated this later. It consists of a smaller piece of masonite glued to two blocks of wood with holes in them. 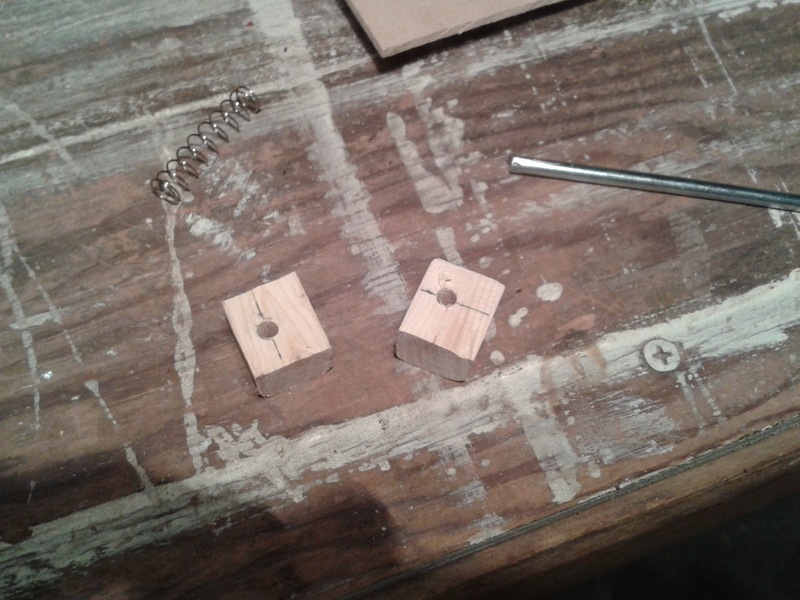 These holes are for two metal dowels, slightly smaller in diameter than the springs, that are not yet connected to anything but will eventually be anchored at both ends. The squares on the green cutting board are each one centimetre, so you can see how small the whole thing is. 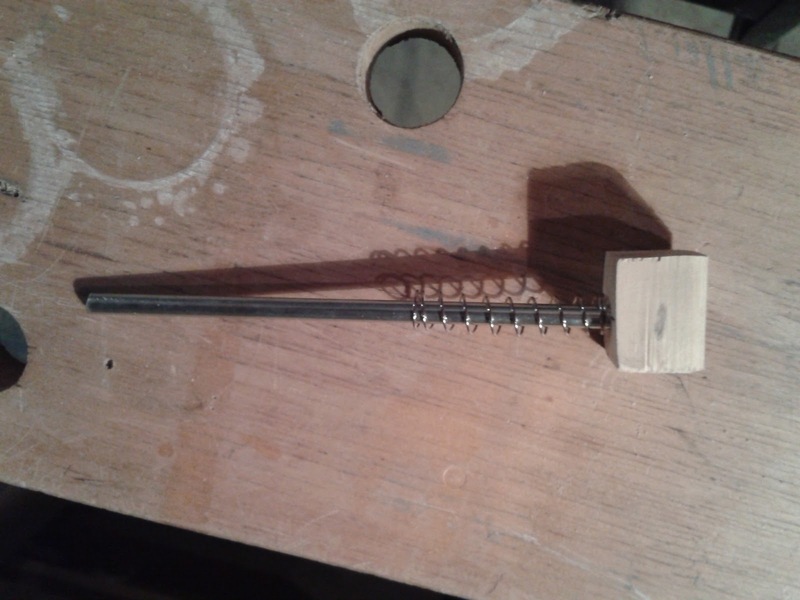 The rotating arm was a challenge, but I found one at Great Hobbies that fit onto the shaft of my motor and had a screw for tightening it against the shaft's flat edge. Another auto-rotated picture. On the "left" you can see what the arm looked like when I bought it, and on the "right" is what it looked like once I cut it to the appropriate size with wire cutters and a nail file. The next step will be to attach all of these together. Hi! My name's Grant Harding, and I'm a puppeteer and filmmaker in Ottawa, Ontario. My main website is http://www.theabstractions.com, but lately I've been wondering if some of the stuff I'm doing would be better suited to a blog. In the meantime, here's a sample of my work: my short puppetry film Face, which debuted at the Chinatown Remixed Festival here in Ottawa and won People's Choice at the Riverside Saginaw Film Festival in Saginaw, Michigan. Face from Grant Harding on Vimeo.